The french team of Hardware.fr has done a big test by measuring the real power consumption of 73 graphics cards. So the max theoretical power consumption of a card can’t exceed 75+75+150 = 300W. To measure the power consumption of PCI-Express power supply connectors, just use a voltmeter and and amperometer. To measure the power consumption of the PCI-Express X16 bus, a PCI-Express bus extender is required like this one (see picture above). Two 3D apps have been use to push the cards to the max: FurMark and 3DMark06 (Pixel shader test). You can compare the results of these tests with the graphics card TDP database. In the dual-GPU cards, the most demanding is the Radeon HD 4870 X2 with more than 320W under 3DMark06 and around 310W under FurMark. The GeForce GTX 295 reaches its maximal power consumption under FurMark with 295W while the Radeon HD 5970 exceeds 300W under FurMark. The complete test is available HERE in french. The gtx275 numbers match my measurements. Greedy, indeed. 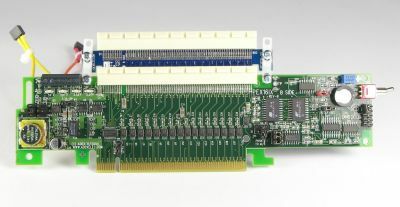 Any chance of updating the graphs with the figures of what was drawn through the PCIe slot and what was from the connectors? would be very useful when considering PSU rails.